Racism and other inequities have long impacted the lives of many New Zealanders including Māori, Pasifika, immigrants, gender diverse communities and others who experience discrimination based on their ethnicity, socioeconomic status, gender and sexuality, ability and so on. In the wake of the mosque attacks in Christchurch on March 15th, racism has risen in the collective consciousness of all New Zealanders and we are increasingly committed to educating ourselves and being actively anti-racism going forward. 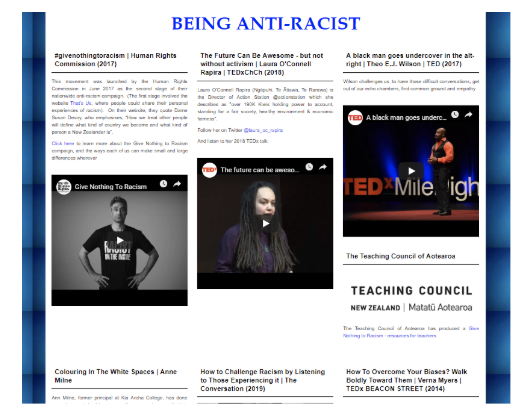 To support our growing awareness, self-awareness and actively anti-racist behaviour, we’ve curated a range of multi-media resources with which you might engage. These include TED talks and other videos; articles and books; blogposts and Twitter feeds from Aotearoa New Zealand and beyond. We hope these varied resources fortify you responding to our national call to action, in having those difficult conversations and in continuing to Give Nothing to Racism (Office of the Children’s Commissioner, 2016). In this section, you will find seminal and current information which helps us to reframe racism, not as the horrible actions of a few people but as the wider structural inequalities that continue to benefit Pākehā whilst disadvantaging other groups. We unpack white privilege as a fact of Pākehā lives, a result of the messages we’ve internalised our entire lives. As every one of us is more privileged in some areas, and less privileged in others, privilege is nothing to be ashamed of; rather, it is something to reflect on, unpack with others, and spend to ensure safety, wellbeing and equitable lives of others. 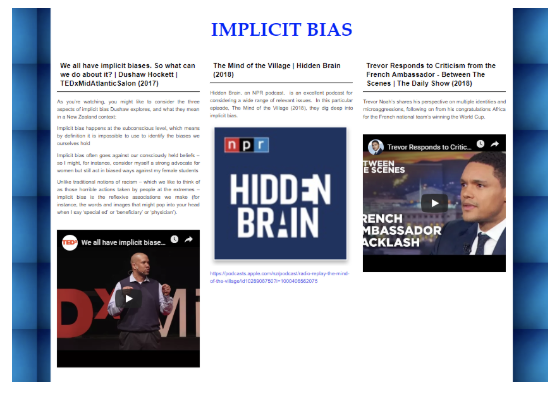 These resources consider implicit/unconscious bias, often more insidious and harmful than explicit acts of racism as bias seeps into the stories we tell ourselves about others, our subsequent responses and the other ways we maintain an inequitable status quo. For instance, take a moment to note what bubbles up for you when you hear the word ‘beneficiary’, ‘refugee’ or ‘homeless person’. Unconsciously, the beliefs you hold influence your attitudes, reactions and attribution. Knowledge is only useful to the extent to which it shapes our thinking and actions. This content is designed to support active anti-racism: the small and large ways we act to spend our privilege by amplifying the voices of others, addressing inequities and working to co-create a more just society. As Ijeoma Oluo (2019) writes, confronting racism is not about the needs and feelings of white people. Rather, the conversation must remain centered on the safety and wellbeing of every group historically and currently marginalised within our system. Nothing expands our thinking more than inviting diverse perspectives in our lives. In this section, we suggest leaders from diverse backgrounds that you might like to read, listen to, follow on Twitter. We have included a range of thought leaders, people having the difficult conversations ‘out loud’ and helping us to understand a way forward. In the light of the March 15th attacks, it is heartening to see New Zealanders of all ages, ethnicities, religions joining Prime Minister Jacinda Ardern in actively fighting against racism. We hope through this curation of resources it empowers you to be actively anti-racism going forward. Ninety five year old veteran John Sato shows that we are never to old to take a stand. His wise words “It has brought people together, no matter what their race or anything. People suddenly realised we're all one. We care for each other" are indeed a legacy to embrace.